Toasted Wholegrain Oat & Honey Clusters with Raisins & Whole and Sliced Almonds. ...and butterflies and hedgerows. It's great to see them in all their glory and they'd be missed if they weren't here. That's why since 1985 we've worked with British farmers to set aside 10% of land for wildlife, and we're joining forces with our friends at The Wildlife Trusts to do even more to help wildlife thrive. So that's one less thing to worry about. There's lots more to say about the things we do. We know cutting sugar is a topic on everyone's lips, that's why we're looking for ways to reduce sugar without compromising on quality. It's a tricky thing to do, a sugar helps create the crunchy texture and taste we know you love. But take our word for it, we're on the case. We take the best quality ingredients and don't mess about with them. 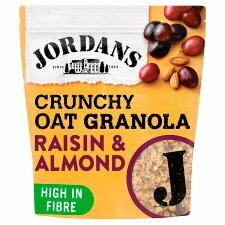 Wholegrain British oats, blended with a hint of honey and baked to a crunch, with generous handfuls of raisins and almonds. After 40 years we think we know how to make the best Granola, but you can be the judge of that. 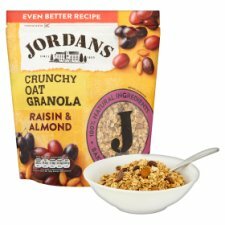 Tell us what you think of our Granola. We hope you love it like we do, but if you're not happy we will do whatever we can to help. This won't affect your statutory rights. After each use, close the bag using the reseal closure and store in a cool and dry place.